E’ il Partizan Belgrado la porta per l’Europa di Jong Il-Gwan. Il giovane attaccante coreano prenderà parte alla tournee di preparazione dei belgradesi in Turchia dall’8 gennaio e verrà valutatao dall’allenatore dei bianconeri Marko Nikolić. Il direttore generalde del Partizan, Darko Grubor, ha inviato in Corea una lettera di garanzia che prevede anche la possibilità per il giovane di giocare tutte le partite della nazionale. Fahrija Šekularac ha dichiarato: “questo è un grande giocatore ed è poco costoso”. Posted in Senza categoria and tagged jong il gwan on dicembre 29, 2013 by calciocorea. Pyongyang, December 21 (KCNA) — Various sports games take place in each weekend in the Democratic People’s Republic of Korea. A men’s soccer match was held between Ryongaksan and Hwaebul teams at Kim Il Sung Stadium on Friday. The former beat the latter 1:0 in the match. The two teams will have another match at the stadium on Sunday. On Dec. 29, the last Sunday for this year, there will be women’s boxing competitions at the Pyongyang Indoor Stadium. An official of the Ministry of Physical Culture and Sports told KCNA that it has been decided to make it a rule to organize sports games in each weekend, with an aim of upgrading the techniques of athletes and stirring up sports enthusiasm among the local people. The step will be helpful to speeding up the building of a sports power, he added. Posted in Senza categoria on dicembre 24, 2013 by calciocorea. Posted in Senza categoria on dicembre 20, 2013 by calciocorea. 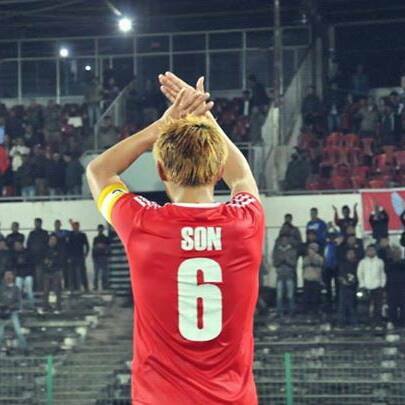 Posted in Senza categoria and tagged Son Min-Chol on dicembre 18, 2013 by calciocorea. After registering their first ever I-League win at home, there was cause for another big celebration on Friday as Rangdajied United were crowned the new champs of the Imperial Blue Shillong Premier League with a narrow, yet somewhat calm 1-0 win over their rivals Malki in the floodlit JN Sports Complex. A goal by the resilient David Ngaihte and a stellar performance by man of the match Dapbor Bareh allowed the blues to walk home with a memorable victory after losing out on a close-fought final encounter last year against Royal Wahingdoh. David Ngaihte’s 60th minute goal following a mix-up inside the penalty box ensured the I-League promoted side a deserving win as they ended their SPL campaign unbeaten with 14 wins and a draw. After a Rangdajied corner, there was a scramble in the penalty box, creating an advantage for David who fired in a shot past goalkeeper Larry. Malki looked jaded in the second half after displaying some attacking football in the early stages of the game. Malki’s counter-attacks were unsuccessful and their striker Samson Nongrum, who was having a good run in the league, looked depleted in the latter half therefore weakening the attack to an extent. The local side nearly found an equaliser in the dying minutes through a header, but the ball just barely missed the target. Rangdajied, fielding some of their star players, eventually held on tight for the last few minutes to break a three-year Shillong Premier League title run by Royal Wahingdoh. Posted in Senza categoria and tagged Kim Seng Yong on dicembre 18, 2013 by calciocorea. VADUZ (Liechtenstein) – Leader di Challenge League, il Vaduz ha ottenuto il prestito dell’attaccante nord coreano Pak Kwang-Ryong, in provenienza dal Basilea. Il giocatore 21enne era già stato prestato alla compagine del Liechtenstein in estate, prima di ritornare a Basilea. In cinque gare con il Vaduz, Pak aveva realizzato due reti. Posted in Senza categoria and tagged pak kwang ryong on dicembre 18, 2013 by calciocorea.